We are all journalists and publishers now: at the touch of a button we can send our words, sounds and images out to the world. No matter whether you're a traditional journalist, a blogger, or handling social media for a company, everything you publish or broadcast is still subject to the law. But which law? This widely used practical guide to communication law is essential reading for anyone who writes or broadcasts professionally, online or in traditional media. It shows how to publish or upload what you want, while staying on the right side of the law and behaving ethically. This fifth edition has been substantially revised to reflect the international nature of online media. It covers defamation, contempt, confidentiality, privacy, trespass, intellectual property, and ethical regulation, as well as the special challenges of commenting on criminal allegations and trials. Recent cases and examples are used to illustrate key points and new developments. 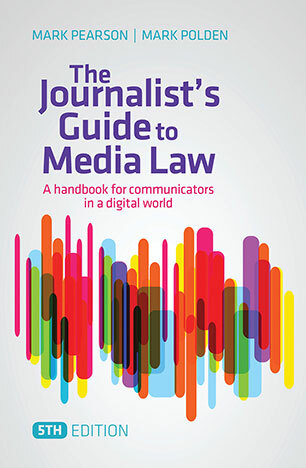 It includes a new chapter on the law of public relations, freelancing and media entrepreneurship. MARK PEARSON is Professor of Journalism and Social Media at Griffith University. He is author of Blogging and Tweeting Without Getting Sued, has worked as a journalist for international and Australian media outlets, and is Australian correspondent for Reporters Sans Frontieres. MARK POLDEN is a Sydney barrister. He was formerly in-house Counsel for one of Australia's largest listed media companies, and has advised and appeared for numerous defendants in media law cases.